Gaming chairs are designed to take gaming pleasure to the max. Whether you have a Playstation, Wii, Xbox, or are playing on a laptop or pc, gaming chairs help to bring games to life and offer more comfortability for extended play. 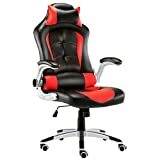 We understand that gaming chairs are an investment, and to that end we have put together this gaming chair buying guide to help you choose a gaming chair you will be satisfied with. Gaming chairs differ in their movement, comfort and features. The three main gaming chairs are rockers, racers and pedestals. To help you choose, here is a summary of the types of gaming chairs for you to compare. Rocker Gaming Chair: Gaming rockers are designed to be placed directly onto the floor as close to the monitor as a gamer wants it to be. Their lightweight L-shape design allows for gentle rocking or comfortable seating while playing your favorite game. 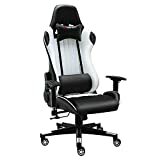 Racing Gaming Chair : For avid car game enthusiasts, gaming racing chairs are built to mimic the driver’s seat of a vehicle, and include pedals and wheels. 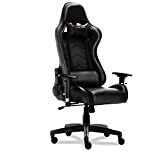 If you are looking for an authentic feel for more realistic racing play, then this chair is for you. 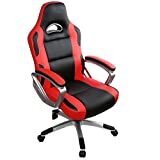 Pedestal Gaming Chair: Pedestal gaming chairs are designed to be elevated, tilted, and swiveled, and therefore offer the most movement flexibility. Assembly: Gamers appreciate their new gaming chairs more if they are easy to assemble and set up, and come with clear instructions. Choosing a good brand with positive set-up reviews will ensure your new chair can be quickly set up. Comfort: Gaming chairs are rated on their comfort, and chairs that are not comfortable to users do not get good ratings. 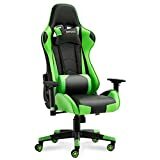 Gaming chairs that can accommodate the player, no matter the height, and adequately reflect the game requirements of the player are rated much higher. Sound: Sound is a top consideration for game chair owners. Chairs with good quality sound are reviewed well, while ones that don’t have adequate sound do not fare well. 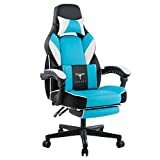 If this is a concern for you, compare the manufacturer specs and reviews of gaming chairs to make sure you will be satisfied with your purchase. When choosing your new gaming chair, consider the type of games you will be playing and the movement and comfort you will need while playing. If you will be connecting your gaming chair to your entertainment set-up, it will need HDMI ports. Gaming chairs are either made of cloth, vinyl, mesh, or polyurethane materials. Vinyl and polyurethane are much easier to clean, and cloth and mesh chairs tend to be cooler. Choosing between materials will be a matter of personal comfort preference. For added comfort, cushioned seating will be more comfortable for extended gaming sessions, and adjustable armrests will give your weary arms a break without needing to stop the game. Where will you be using your chair? If you plan on moving it between sessions, opting for a folding chair that is easy to store will save you a lot of hassle. Choose a gaming chair with side storage to keep remotes and controls in one easy-to-get-to place. To feel more impact while playing, choose a gaming chair that vibrates with the jolts in the game. When buying a gaming chair with added sound and other features, make sure that your gaming chair will be compatible with the gaming system you are playing on. If you are looking for a gaming chair with built in sound - go wireless. 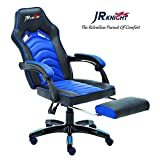 Gaming chairs that offer wireless or bluetooth connectivity will make setting up sound to play through the headrest speakers hassle-free. They also allow for much easier movement of the chair around the house if and when it is needed. For the ultimate sound, look for a chair that includes a built in subwoofer. The last thing to consider is the size of the chair. Check the measurements of the product before purchasing to make sure it will be a comfortable fit for the player. Ace Bayou: Ace Bayou specialize in manufacturing innovative lifestyle furniture. 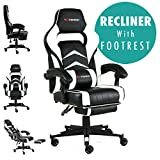 Their X Rocker gaming chair brand is a leading brand in this niche market.